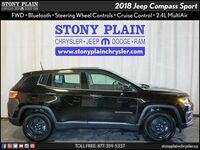 The 2018 Jeep Compass in Stony Plain AB brings Jeep’s reputation for rugged performance to the small crossover segment. 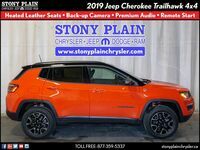 This capable crossover offers the impressive off-road performance car shoppers expect from the Jeep name. All Jeep Compass models come powered by a 2.4-litre Tigershark four-cylinder engine. This engine is rated at 180 horsepower and 175 pound-feet of torque. Transmission options include a six-speed manual and a nine-speed automatic. Front-wheel drive is standard, but all-wheel drive is available as an added feature. Fuel economy ratings are estimated at as low as 7.3 L/100 KM highway and 10.4 L/100 KM city. The engine allows the Compass to tow up to 907 kg (2,000 pounds). The 2018 Compass will be offered in four trim levels: Sport, Latitude, Limited and Trailhawk. Sport models start things off, coming equipped with 16-inch wheels, air-conditioning, 5-inch touchscreen Uconnect system, Bluetooth and USB connectivity and a six-speaker sound system. Latitude trim levels upgrade the wheels and the interior upholstery, adding simulated leather seating surfaces, a leather-wrapped steering wheel and keyless entry and ignition. 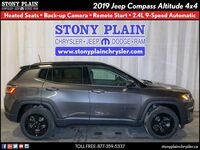 Compass Limited models add 18-inch wheels, the 8.5-inch Uconnect touchscreen infotainment system, Apple CarPlay and Android Auto, dual-zone automatic climate control, heated seats and leather upholstery. 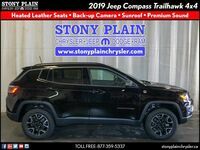 2018 Jeep Compass Trailhawk models offer multiple features designed to optimize the crossover for off-road performance. 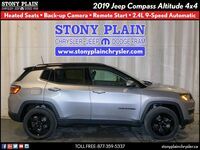 All-wheel drive is included as standard equipment, along with 17-inch wheels with off-road tires, a raised suspension, special styling and fascia, Selec-Terrain system, tow hooks and underbody protection shields. A variety of available features will also be offered on the 2018 Compass. 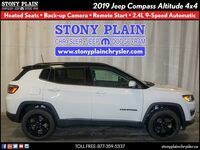 Available features include a navigation system, sunroof, Beats audio system, power liftgate, xenon headlights, forward collision warning and mitigation and lane departure warning and intervention. 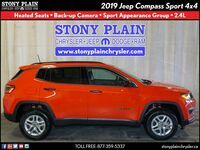 Interested in a Jeep Compass?